Sponsoring giveaways is an effective way to build buzz about products, grow your social media following, and encourage sign-ups to your newsletter. But once you come to the end of your giveaway's entry period, you are faced with an important question: how to randomly pick the contest winner or winners. A truly random winner selection process is vital to avoid accusations of favoritism or fraud. You should also keep documentation that shows that you picked your winner fairly. Here are five resources to help you randomly pick a contest winner fairly and easily. Among the many interesting features that Google offers is a random number generator. Using it to pick your winners is easy and free of any charge. To start, assign each of your valid entries a number. One way to do this fairly is to assign a number based on the order in which the entries arrived. Your first entrant would be number one, the second would be assigned number two, and so on. Then go to Google.com and search for "random number generator." This will bring up a box that will ask you to enter the minimum and maximum numbers to use. The minimum should be "1" and the maximum the number of total valid entries your giveaway received. Once you have entered these, press the blue "Generate" button. If you prefer not to use Google, there are many free random number generators available. Just do an internet search to find your favorite. Whichever generator you use, it's a smart idea to take a screenshot of the result to document how you randomly picked the contest winner. 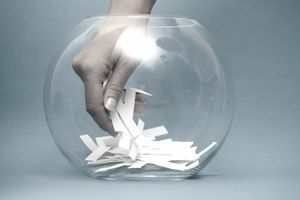 If you prefer to pick the contest winner's name directly, rather than assigning each entry a number, you can use a random name picker like the one offered by MiniWebTool.com. To use MiniWebTool's random name picker, enter one name per line into the text field and then click on the button to "Pick a Random Name." One name will be drawn at random to be your winner. Again, you can take a screenshot for documentation. Of course, typing each name into the text field is time-consuming, but if you are keeping records of your entries in a spreadsheet, you may be able to simply copy-paste the entire list into the web form. If you are running a contest on your Facebook page's timeline, you can use Woobox's free Pick a Winner Tool to randomly choose who will walk away with a prize. To use the tool, sign up with a free account with Woobox and connect your Facebook account. Then click the "Posts" tab to select the post you want to use to select your winners, select whether comments alone or comments and reactions count as entries, and click the "Pick Winner" button. Take a screenshot of the result. If you upgrade your Woobox account to a paid account, you can use the same tool to contact the winner. If you want to avoid spending money, you can contact your winner directly. Note that you can also use the Pick a Winner tool to randomly choose winners from Twitter or Instagram comments and hashtags. If you are building your YouTube following by offering giveaways to people who comment on your videos, the YouTube Comment Picker will make randomly picking your winners easy. All you need to do is to put in the URL of your video and click the search button. Once the URL has been entered, click another button to choose the winner. A few seconds later, you'll have the winning commenter's name. When running giveaways on Instagram, it can be difficult to keep track of who has left valid comments, shared the giveaway with friends, and used hashtags to enter. But an app like Easypromos' Instagram Sweepstakes App can help. When your winner has been chosen, Instagram Sweepstakes will also give you a winner's list and a certificate of validity to show that the contest winner was really chosen at random. Your first giveaway made through the Instagram Sweepstakes app is free, giving you the chance to try out the service with no risk. You will need to purchase a subscription for any additional giveaways after the first.